Tidewater Community College’s interior design students embraced the Pallet Challenge by creating some stunning pieces from discarded shipping pallets. Sponsored by TCC’s student chapter of American Society of Interior Designers (ASID) and the brainchild of co-presidents Matt Keane and Whitney Regan, the Pallet Challenge was held on March 28. Six contenders — Lisa Bambury, Ruby Hutton, Matt Keane, Samantha Piney, Whitney Regan and Lindsay Willards — entered, bringing their individual styles to play in their pieces. The students were required to use 90 percent of the pallet in the creation of the entry or retrofit the pallet to make something new. 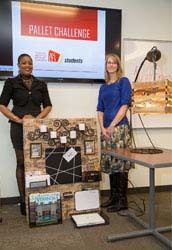 Entries were presented by students to a group of interior design supporters, friends and family. Ruby Hutton and Lisa Bambury. Two contenders took home the top awards. Bambury, an electrician by trade and owner of an interior design/lighting business, took first place for using 90 percent of the pallet in her wavy lamp creation. Hutton, a 20-year Navy veteran retraining for a new career, took first place for retrofitting the pallet to make a portable office. Three of her six children were present to see her take home the gold. Each contestant was recognized for participating in the challenge. TCC’s ASID leaders are hoping to make the Pallet Challenge an annual event. Pallet Challenge winners are Ruby Hutton and Lisa Bambury.